Hello, Coffee Lovers! It's time for some COFFEE! 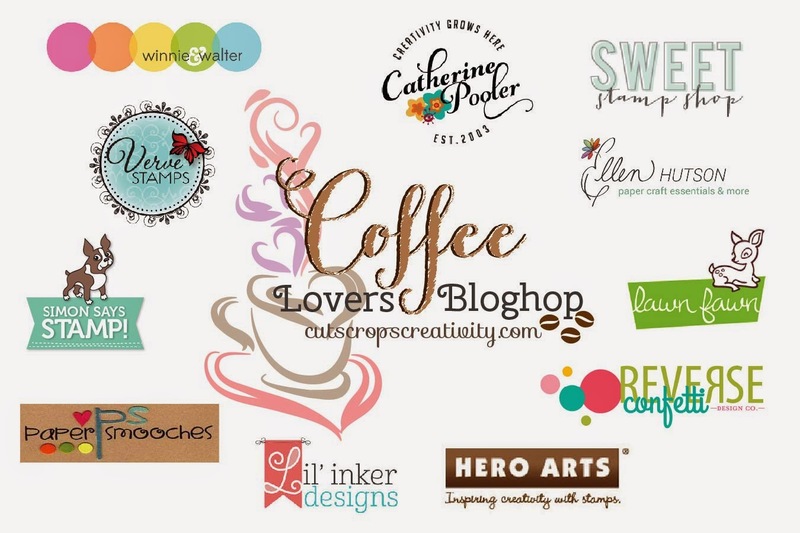 Welcome to the Coffee Lovers Blog Hop! Grab your favorite coffee stamp set and play along with us! Head on over to Chaitali's Blog...Cuts, Crops & Creativity, to read all of the details of this fun blog hop! 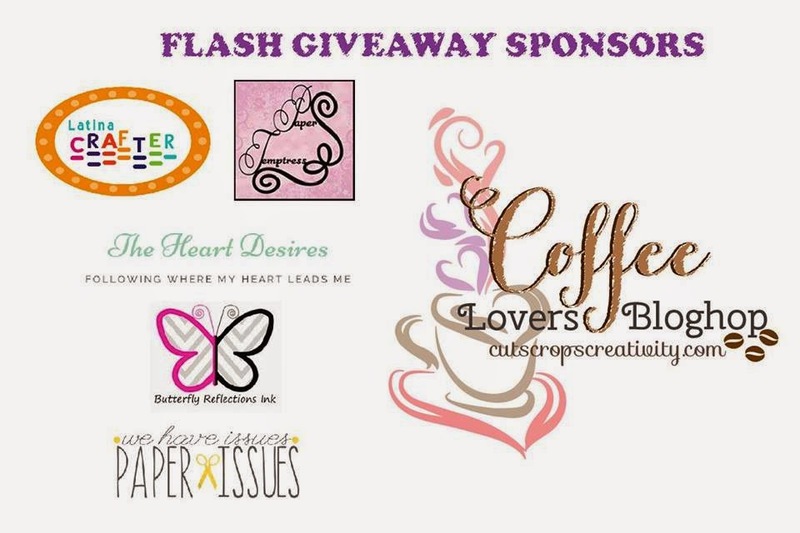 and some Flash Giveaway Sponsors, too! So, let's chat a bit about coffee! 1. When did I start drinking coffee? My father would always go to the coffee shop in the mornings and have coffee, mom's early beverage of choice was Diet Pepsi...so I didn't grow up with coffee around. Once I started college and studied late at night for tests, I thought I'd try coffee to perk me up on those long nights. I started drinking coffee with a little sugar, and soon fell in love with its aroma and warmth! 2. What is my favorite brand(s)? Dunkin' Donuts French Vanilla is my all-time favorite brand and flavor of coffee! My husband tries to sneak in off-brands on occasion, and I remind him every time of my preference, even if it costs a couple dollars more. Husbands! 3. What is the most amazing coffee that I've had? Where and when? When my hubby and I met, we would spend Saturday mornings at a pancake house in a Chicago suburb that had the STRONGEST coffee. It soon became our standard of coffee at restaurants and we craved strong coffee for several years after that. get a headache, even a bit nauseous, and irritable! Yes, I'm a coffee addict! It's hard to believe that I was able to quit drinking coffee while pregnant, even had an aversion to the aroma when I was expecting my sweet daughter...hubby was not even allowed to brew a pot at home for a few months! LOL! I LOVE COFFEE! I begin each and every day with a cup (or two or three), taking my jumbo Tervis filled with coffee on work days! 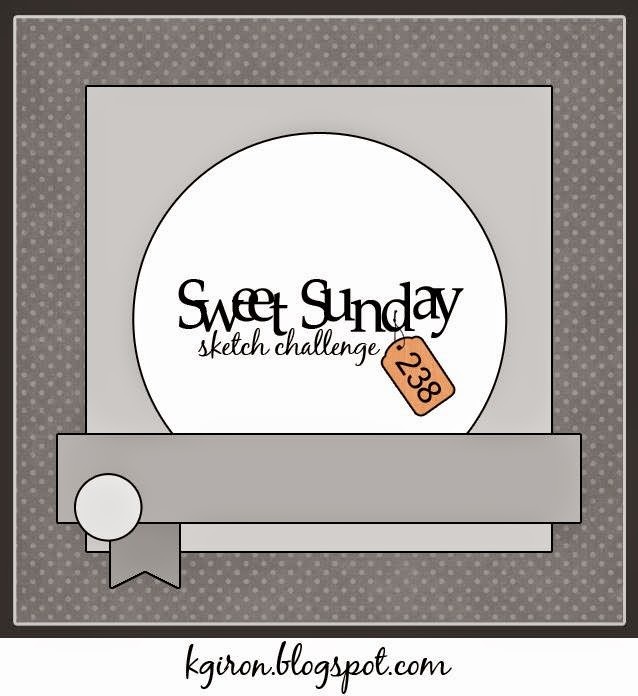 Karen's Sweet Sunday Sketch Challenge #238 was just what I needed to frame up the flavor of the day! I used some fabulous Verve goodies on my card today! I LOVE the new coffee-themed goodies from Verve! I can't get enough of that awesome Coffee Word Die paired up with the Coffee stamp set and Cuppa Joe Die Set....then a few sprinkles of the Signature Sequin Mix and you've got yourself a fun mix of fun! 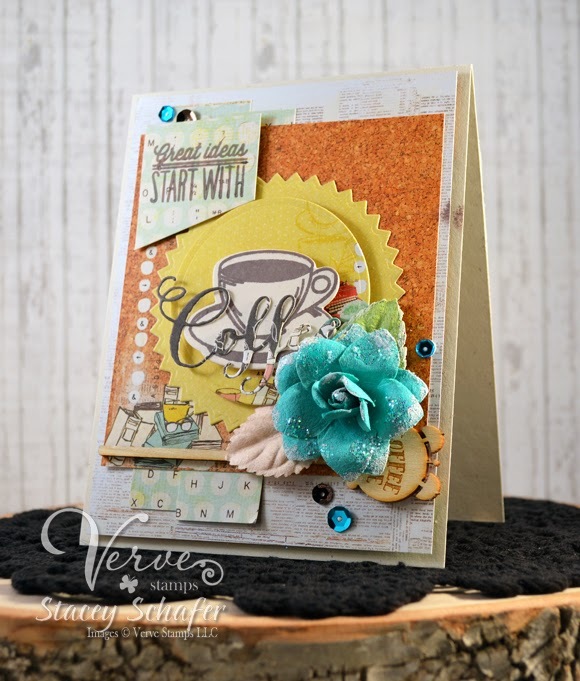 The papers, flower, leaves and wooden stick are from the Prima Coffee Break Collection...love! This is so pretty and you're right - great ideas start with coffee. If I didn't have my coffee, I would have no ideas because I would be in a fog! Yay for coffee! WOW! This is AWESOME!!! Lovin' all the layers! Great card Stacey! Love all the elements! Nice card Stacey! Love your design and color palette! Sweet card Stacey. Love the images and the gorgeous dimensional flower. Oh Stacey, I love your pretty card! I also hear you on the need for coffee...it's a necessity! Beautiful layers and love your card Stacey! Oh my goodness Stacey! Your card is simply gorgeous...your embellies are perfection! Beautiful card, Stacey! Love all your eclectic layers and papers. The look reminds me of my new favorite local coffee shop. Oh this is spectacular! Love all those layers and the colors you combined look fabulous! Happy Caffeinated Day! Stacey, this is gorgeous! Simply stunning. This is yummy beauty :) lovely layers and colors ! Pretty. Love the sparkly flower too! I just love layers and this card is all kinds of awesome layers. Love it! What a great card! I actually just bought this stamp and die set from Verve! LOVE your card...you always rock the layers! That sugary bloom is a perfect way to top off your card...Oh my, do iSpy coffee veneer? Is that from Prima? We LOVE that Verve is one of our Super Sponsors! What an amazing card! LOVE it!!! This is just a stunning card. I love each element used.